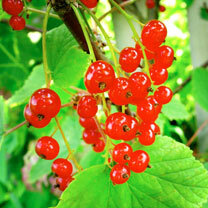 Early red currant to be harvested from the end of June. Large, uniform panicles with attractive shiny berries, perfect for snacking. Provides constant high yields with healthy leaves and upright, compact bushes and is very resistant. Perfect for permeable soil. Ideal for cakes, jams and desserts or for snacking directly from the plant. Harvest June-August. Height 60-70cm (24-27"); spread 70-80cm (27-31"). Supplied in a 2 litre pot. Ideal for beds and borders, patio pots and containers. Attractive to butterflies and bees. Prefers full sun.